Cocoa beans were an important part of the Mayan diet, although limited to use as a luxury item. Mayans grew cocoa and also used it as a currency. It was a highly treasured item in the Mayan society and the consumption of chocolate made from cocoa was limited to the Mayan nobility. The chocolate was typically consumed in the form of a drink laced with chili peppers. Cocoa beans also held religious importance for the Mayans and were associated with the Mayan gods. They were used at religious ceremonies as offerings to the gods, sometimes as a replacement for sacrificial blood. Mayans were the cultural descendants of the Olmec civilisations who also grew cocoa. The Mayans began growing cocoa in the low-dwelling lands where the temperature and climate was suited to its cultivation. According to historical estimates, such cultivation by the Mayans began as early as 200 B.C. Later when most of the Mayan populations had shifted to the Yucatan region, Mayans developed new methods of cultivating cocoa in personal gardens. This required innovating the cultivation process since the climate of Yucatan wasn’t ideally suited to cocoa growth. Many Mayan sources depict chocolate as food that was meant for the gods and royalty. Many Mayan sources depict chocolate as food that was meant for the gods and royalty. Some Mayan hieroglyphs, as depicted on extant ceramics and murals from different Mayan cities, show chocolate being poured for gods and the rulers. In general, the consumption of cocoa and chocolate drinks were limited to the rich elite. Mayans also had a cocoa god, and given the treasured status of cocoa as a food items, cocoa offerings to god were considered a valuable tribute. It was for this reason that Mayans sometimes used chocolate drinks as an alternate to blood, believing that the gods would like them as much or prefer them. 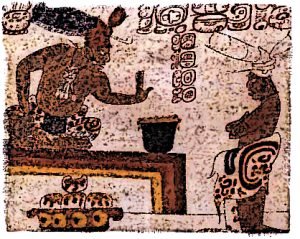 Consumption of chocolate in the Mayan society was mostly limited to the nobility class. A major reason behind this was the fact that the cultivation of cocoa was done on a limited scale and in many Mayan cities, cocoa had to be imported from other cities. This put a premium on the consumption of chocolate. And while the elite often consumed it in the form of a luxurious drink, the commoners consumed chocolate rarely, if ever. This made chocolate a feature of the social stratification of the Mayan society. Mayans prepared chocolate from cocoa beans in much the same way it is done today. They harvested the cocoa beans and then fermented them for a time. Then the shells of the beans were removed, they were dried and eventually ground up into paste or powder form. Mayans didn’t eat chocolate in solid form. The most common mode of consumption was to make a dense liquid drink out of the cocoa paste and then lace the drink with chili peppers. Often, the drink was mixed extensively so that it had a frothy appearance. It was common among the Mayan elite to consume such a drink at the end of meals, especially as part of their breakfast. Although the most common method of consuming chocolate was as a peppered drink, Mayans also used other flavourings in their chocolate drinks. Among other flavourings that were particularly popular among the Mayans were honey and maize. To make a drink, Mayans would pour it from a vessel at some height to another vessel. This was repeated several times so that the natural fats of the chocolate drink created a thick layer of dark-coloured foam on top of the drink. When the foam appeared on top of the drink, it was considered ready for consumption. Apart from being considered the food of the gods, cocoa had many other religious and ritual uses in the Mayan society. For instance, cocoa paste was used in a ceremony to anoint young Mayan boys and girls. Cocoa was also commonly placed alongside the deceased Mayan rulers in their graves. This was done in such a way as to ensure that when the dead were confronted by the gods, they had cocoa to offer to these gods and thus secure their way through the underworld. Utensils related to storing and consumption of cocoa drinks was also placed in the tomb of a deceased ruler. Cocoa beans were considered a highly valuable item in Mayan society and were used as a currency in the Mayan marketplaces. The royalty also used cocoa beans as gifts to fellow rulers. Such Mayan cities which enjoyed power and had influence over many other city-states usually extracted tribute in the form of cocoa beans. This was especially true for such Mayan cities which were situated in relatively drier regions and couldn’t cultivate cocoa on their own. Apart from making chocolate drinks from cocoa, Mayans also had a way of making a rudimentary sort of snack-bar using cocoa. This was done by pressing cocoa into tight slabs together with cornmeal. Mayans typically used these slabs for journeys and as a food source while being on the go. They were popularly used by the Mayan warriors who carried these cocoa bars with them as a ready source of nutrients. According to some Mayan sources, the enemies of the Mayans frequently stole these bars from the Mayan warriors, coveting the cocoa beans. Mayans were among the earliest societies who consumed chocolate. Mayans learned the art and culture of consuming chocolate from the previous Olmec civilisations which is considered the precursor to the Mayan civilisation. Mayans not only cultivated cocoa in regions conducive to the growth of the beans, they also grew it in lands not known for cocoa growth by using different innovations. Typically, it was consumed by grounding cocoa beans into a paste and then making a chocolate drink out of it. The drink was usually limited to the nobility and commoners rarely consumed chocolate in any form. Chocolate was also used as a currency in the Mayan marketplace and as a gift by Mayan rulers.